I'm trying to move more into abstraction, away from my realistic roots. I have a therory that good abstraction can come from good foundation, but it's a process I'm still struggling with. 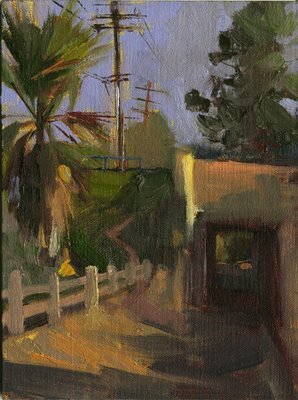 Here is a little studio painting (6x8 oil on linen) of a building in Fresno deliberately picked to to a flat angle based more on pattern than depth. I'm trying to be a little more abstract (baby steps) with a rougher approach, tilting the ground plane and trying to be flat yet with some elements almost normal. I think this is an "on the way to something" rather than a success at something new. When I do these, I start out feeling brave and end up feeling I haven't been brave enough. It's a more formal version of my half day class I was teaching earlier this year. I was doing that class for the fun of it and the process of learning how to do best present my teaching ideas, I think I've progressed enough to attempt a little larger, more intense class linked with a school. The regular class is suspended indefinitely, but not necessarily permanently, I may come back to it, but this is the only guaranteed thing at the moment. I hope anyone thinking about taking me before will take the plunge so I can do this on some kind of regular basis. You are well on your way to abstraction with this new painting! I'm having the same struggles as you; in my bigger studio paintings I'm trying to move away from realism...it's hard! I wonder why. a big version and take it to a museum! Lesley, Thanks for taking the time to reason out the painting with your down to earth analysis and sharp technical observation. I posted this on the WC boards under abstraction as was puzzled by the art speak. I've got to get up to speed on how contemporary artists curve the language to describe the inner meaning of the work. I think I need to take a class in jazzy art lingo so I can sound like I know what I'm doing. A class in jazzy art lingo..too funny! I read your comments on WC, and I understand what you mean by having an underlying structure/design that is solid. What makes this new approach difficult is that your yardstick for measuring success isn't as clear-cut. How do you know when it's right, or if you've taken it far enough? I wish there was a master art book we could go to and get the answer. These are freaking AWESOME. I am also struggling with the abstract vs. representational thing - which is at the root of my "Fragments" paintings. And as long as you can keep painting like this, I think you can use whatever art speak you want! Well Lesley, that’s' the unmeasurable yardstick is I've always tried to measure myself by. When I was a comic book artist I wasn't realistic enough, when I was a cartoonist I was too realistic, When I wrote comics or cartoons they were to adult, and my style to kid friendly. A few years ago I started breaking into the PA movement and soon found painting timeless nature was not for me. So I when to urban subjects that are handled in a kitsch way in PA and a cold tight serious way in the modern art world. My style has both, a lot of warm impressionism a style looked down upon in some modern circles as kitsch. So I still don't fit in either world. I'm trying to use all styles I find interesting in all categories of art I like, meld it into one style and express contemporary subjects. Even in that, I want to do slightly old dieing places with some kind of underling reflection/ comment on society. So my artistic expression is a complex blend of competing and contradictory ideas... How can a do dark social commentary with happy feeling colors? The answer is making them co- exist, balance, yet be in subtle conflict, creating tension. Ironic or impossibly contradictory? How does the corner of a parking lot convey these ideas? I don't know. I'm hoping it's at least compelling to look at like a car accident or the Israeli/ Palestinian conflict, never solvable, but always worth trying too. Thank you for writing that. What you said is so honest and true. It's frustrating when your art doesn't seem to fit anywhere (I dropped out of OPA for the same reasons). Your path is a unique one, and it takes a lot of courage to stay on it. All I can tell you is that you make some of the most gutsy, exciting paintings I've seen in a long while. Your art is an inspiration to me and to many other painters as well. I like the abstract piece. It's really freeing, isn't it, to go abstract? When I paint abstract, I feel I can focus more on color relationships, light, other things. I've been playing with that myself, hope to post tomorrow a little 6x8 too. Look forward to seeing you at SLO coming up. Bill, I think these paintings are definitely a success. It isn't the first time your paintings have incorporated aggressive abstraction, but in the case of the topmost painting it's by far the best instance I've seen. 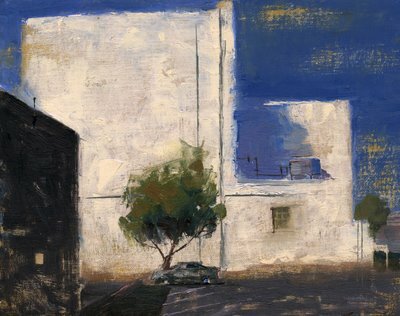 But it's the second painting that makes me wish I lived out there so I could sign up for your workshop. It's another of those paintings of yours where for some reason I feel like I'm trespassing when I'm looking at it. It's a good feeling. Somtimes I think an abstract shape in a semi realistic painting is much more interesting to look at than a realistic detailed rendering of the same shape. You've illustrated this point nicely here. I like where you're going with this. Very nice. Hey Glam, You might consider trying to put one together in you neck of the woods, If you can't come to me, maybe I can come to you. Hey Jert, I almosted missed your post. ;-) Nice comment, we always what people to linger on the work , yes? For anyone interested in the Entertainment Art academy class, I had the benefit of taking part in professor Wray's half day classes and I would highly recommend learning from him. He's very knowledgeable in his craft and his work as seen on this blog speaks for itself. He is as learned as he is tall. His style of teaching is direct, easy to understand and he guides the student through the process one step at a time. Thanks to his one on one teaching style and teaching through example I was able to learn more about painting from our few sessions then from semesters worth of classroom study. This class is one you can not miss! Even though most of your work in pretty real, I think your cropping is kind of abstract sometimes ( in a good way) if that makes any sense. Very nice of you to say. One of the frustrating things is there are a lot of people who would like to take my class, but are put of by having to leave their house and buy art supplies. There is always something to do in peoples lives or on the weekend you want to kick back and recover from the night before debauchery. That’s why I'm thinking that the workshop is the way to go, makes it more special than oh he always teaches on Saturday, I can do that whenever I get around to it. 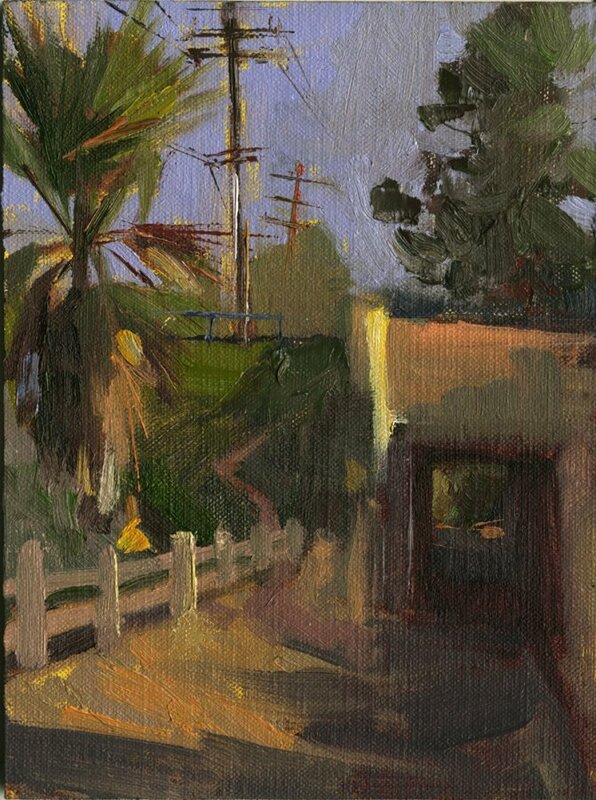 Wish I could convey to artists how great it is to painting outside, the feeling and the light you can never get in a studio form a photo and the excitement of the new location, mixed with relaxation. I love the blue with the tree in the top painting ! Nice work ! You're getting great results already with your move to abstraction. thanks Shari, Usually I don't go that dark an pure with it, but in this case I wanted the building to glow. thanks LP I wanted to see your bolg, but the link is dead.